Often the first question when a player orders a Lawler Trombone is" What do you suggest for bell and slide?" Here is one of the most popular combinations for bell stem and flares that will accommodate great all around performance. Bell section: Model 1-.022 This is a yellow brass stem .022 thickness with a yellow brass main tuning slide crook as well as yellow brass neckpipe. These two flares coupled with the yellow stem will give you the best color change. The yellow flare will give you the ability to play out easily with a full directional sound. The red brass flare will give you a warm soft buttery sound that works well in combo situations and small group playing. Thats the great thing about the screwbell system. Spin it on and try it. Slide section: Bore size comes down to personal preference. However the .500 bore is my most popular. That is a Ultralightweight brass outer slide tube with brass end bow. I think when you have a trombone made out of all brass (no nickel) you get a more fluid and even feel from bottom to top registers. Flares: Any 2 bell flares. Thickness and rim size I offer. All in brush lacquer finish. New lightweight case that holds it all. Above package with Carbon Fiber Slide as primary slide. I have two types of cases for screwbell tenor trombones. 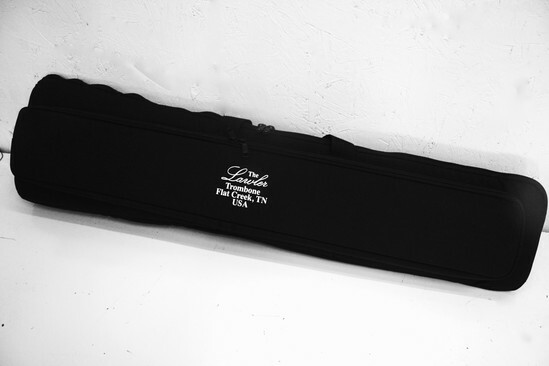 Below is my lightweight hard shell case that will hold any small bore detachable flare trombone and an extra flare.